Not far from my hotel in Copenhagen was the start of the Carnival parade, that takes place each year as part of the Whitsun celebrations. 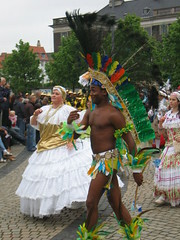 There were lots of women wearing not a lot, but in a very colourful, Latin American canival way. This was one of the few men that stripped down. Drum bands and samba were the order of the day. Given that it was cold and raining, the dancing was the only thing keeping them warm. As the troops went passed, I kep my eye on the shoes. Some groups were optimistic in thinking they could dance and grind the whole way (a lot of it on cobbles) in 3″ heels. Others decided that flat training shoes were a far better choice.